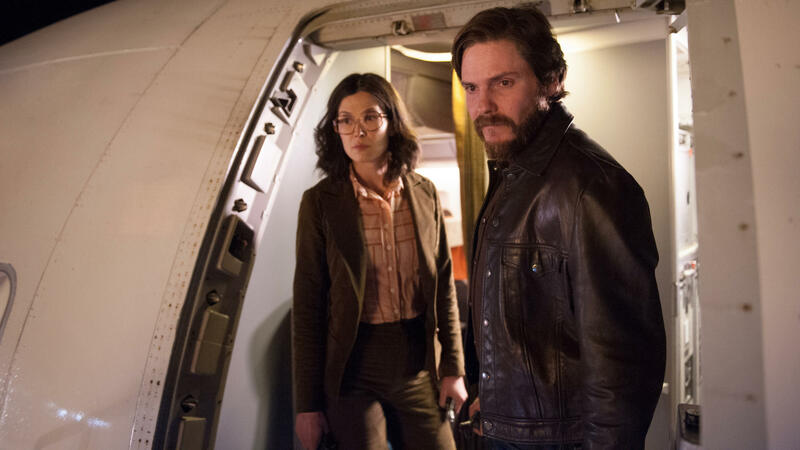 Rosamund Pike and Daniel Brühl star in 7 Days in Entebbe, a film about the 1976 hijacking of a flight from Tel Aviv to Paris. Several films have already been made about this historical incident, which also features in such biopics as Carlos and The Last King of Scotland. Another treatment might have been welcome if it focused tightly on some neglected aspect of the event. But the fictionalized 7 Days barely focuses at all. Even a tight timeline can't keep the movie on track. Meanwhile in Jerusalem, Israeli Prime Minister Yitzhak Rabin (Lior Ashkenazi) debates the best response with Defense Minister Shimon Peres (Eddie Marsan). These sequences don't attempt documentary-style realism. Instead, they stagily deliver well-chewed truisms from the eternal conversation about war and peace and toughness versus conciliation. The movie briefly introduces a few of the hostages, notably a courageous flight-crew engineer and an older woman with a number tattooed on her arm, but most of them are no more central to the story than the dancers who gyrate in and out. Idi Amin (Nonso Anozie) also has a walk-on, but his flamboyant character is merely sketched, and his brutal response to the raid unmentioned. Padilha, probably best known for the streaming series Narcos, debuted with 2002's Bus 174, a riveting documentary about a hostage situation on a Rio de Janeiro bus. Burke wrote Black Watch, an acclaimed play about Scottish troops in Iraq, and the movie '71, in which a lone British soldier tries to survive a night in Belfast at the height of The Troubles. Both Bus 174 and '71 distilled moments of madness into potent, telling miniatures of their respective societies. 7 Days in Entebbe lacks their powers of concentration. The movie's individual parts are respectable, but the way they've been cut together merely blunts their impact.